Paul Cézanne (1839-1906) is certainly as great an artist as any that ever lived, up there with Titian, Michelangelo, and Rembrandt. Like Manet and Degas, and also Morisot and Cassatt, he came from a wealthy family — his was in Aix-en-Provence, France. His banker father seems to have been an uncultivated man, of whom his highly nervous and inhibited son was afraid. Despite parental displeasure, Cézanne persevered with his passionate desire to become an artist. His early paintings display little of the majesty of his late work, though today they are rightfully awarded the respect that he certainly never received for them. His early years were difficult and his career was, from the beginning, dogged with repeated failure and rejection. In 1862 he was introduced to the famed circle of artists who met at the Café Guerbois in Paris, which included Manet, Degas and Pissarro, but his awkward manners and defensive shyness prevented him from becoming an intimate of the group. 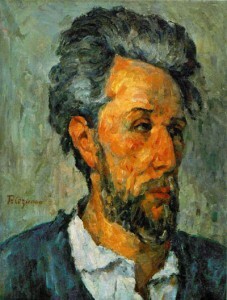 However, Pissarro was to play an important part in Cézanne’s later development. Cézanne is an artist’s artist. He was obsessed with form rather than content, so subject matter was always secondary to the act of painting itself. He wanted the methods and skills of the painter to be more important than the image. That meant the subject of the painting couldn’t be so dynamic as to overshadow the artist’s act of creation. The more he concentrated on this, the less viewer-friendly his works became. But that suited his personality just fine. His goal was not to have a mass audience or sales appeal, it was to satisfy himself.